Volunteers will be bracing the winter weather to help out with landscape maintenance at Old Oswestry hillfort in a new ini a ve. And more people are welcome to get involved on January 30 and 31 when the taskforce tackle their rst session of vegeta on clearance on the ramparts. 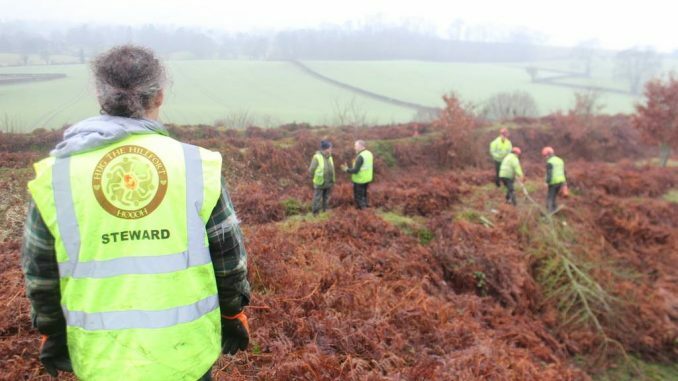 The volunteer e ort is being coordinated by the HOOOH Community Group in close collabora on with English Heritage, guardians of the 3,000-year-old scheduled monument. Work is being supervised by English Heritage together with its ecology consultant. A local landscape contractor is undertaking heavier and more specialised clearance. In addi on to scrub clearance, the on-going programme will include xed-point photography and environmental ini a ves to aid the hillfort’s preserva on. The scheme is one of just a few in England involving local volunteers in landscape maintenance combined with environmental and wildlife ini a ves at an English Heritage site. Anyone who would like to get involved or nd out more can contact Mr Phillips on 07751 160576.